The clinic is developed as a holistic wellness center wherein, services like Pediatric Consultant, Neurology, Pediatric. Dentistry, Pediatric Physiotherapy, Pediatric Occupational Therapy, Homeopathy, Pediatric Psychiatry, Yoga, Fitness training, etc., shall be offered in a phased manner. 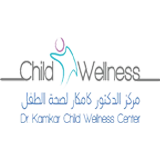 The clinic has chosen highly qualified and experienced pediatric care professionals from different effective and efficient care delivery.